Got Clogged Drains in Lynnwood? We'll Help You! Plumbing Experts NW Will Unclog Any Drain! Drain Cleaning Lynnwood Folks Can Truly Depend Upon! We Do All Snaking & Rooter, to get you flowing. A large portion of plumbing problems come from stoppages and clogs of some sort, keeping your system from getting rid of wastewater and sewage from your home. You won't want to wait long to get your drains cleared and get flowing again. In fact, drain clogs and backups can be bad for your health. This is why Plumbing Experts NW wants to be your drain cleaning and unclogging expert whenever these kinds of clogs and stoppages happen. We approach your drain problems with plenty of experience and we do a proper diagnosis, giving you a clear idea of what's going on with your drain. It's the type of professional drain cleaning Lynnwood WA folks need and should demand from the service they call. 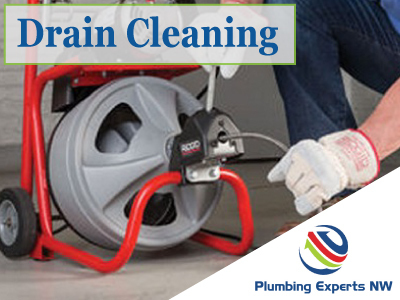 As with any of our plumbing services, we arrive fully prepared for any drain cleaning issue, and we provide all of your options for repair clearly. Some Reviews of our Lynnwood Drain Cleaning Services!